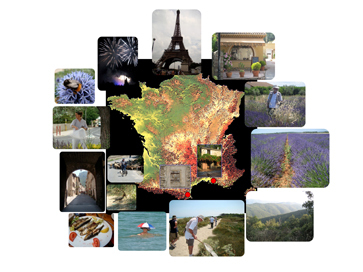 Read about a 2010 trip to southern France to collect bumble bees. 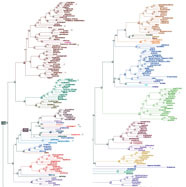 A new comprehensive phylogeny of bumble bees (Cameron et al. 2007) leads to a simplified subgeneric classification (Williams et al. 2008). Computer support for the Bombus phylogeny was provided by the National Center for Supercomputing Applications, which featured this work (and other phylogenetic research in my laboratory) in their highlights journal, "Access" [read the article here]. The bumble bee phylogeny provided a taxon-rich and comprehensive template for exploring patterns of historical biogeography, divergence times, and diversification in the bumble bees. Results from analyses of these patterns, published in a recent issue of Systematic Biology (Hines 2008), reveal numerous phylogenetically independent movements between the major land masses consistent with geological and climatic events pertaining to this mostly cold temperate and alpine group. USDA NRI-funded Research Highlights on Bombus phylogeny and species decline. 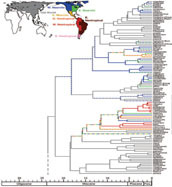 A worldwide stingless bee phylogeny resolves relationships between Old World and New World taxa. 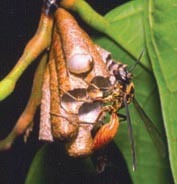 The extraordinary variation found in stingless bee nest architecture is often associated with the phylogenetic position of the species (Rasmussen & Camargo, 2008). A new phylogeny of Vespidae demonstrates the dual origin of sociality in the vespid wasps (Hines et al. 2008, PNAS). A press release note is available here.